Skinner Presents its Fall Auction of American Furniture & Decorative Arts | Skinner Inc.
BOSTON, MA – Skinner, Inc. will present an auction of American Furniture & Decorative Arts on Saturday, November 19 at 10AM in their Boston Gallery. 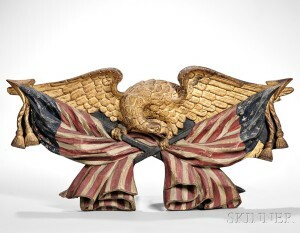 The auction of nearly 700 lots will feature a wide array of Americana, featuring important folk paintings and painted furniture from the collection of Dr. Howard P. Diamond of New York and an extraordinary selection of 19th century trade signs from the collection of Janie and Peter Gross of Pennsylvania. A major auction highlight is the Janie and Peter Gross Collection of 19th-Century Trade Signs (Lots 191-245, 250-258). The forty-plus examples are the finest and most interesting assemblage of signs that Skinner has offered in many years. Businesses represented in the collection include house and sign painting, carom and pocket billiards, hair cutting and shaving, dress makers, boot and shoe makers, bakers, paper hangers, ice cream parlors, jewelers, spirituous liquor sellers, and carriage painters. Janie Gross was by profession a graphic designer and it is the lettering, color schemes, overall design that captivated her attention in these historic objects and inspired her to collect. The auction opens with a group of pilgrim century furniture including examples collected in the early 20th century by Arthur Wellington, a founding member of “The Trestleboard” and a friend of Wallace Nutting and Dwight Blaney. One highlight is a classic and finely-detailed Massachusetts oak chest over drawer, ca. 1650-80 (Lot 23, Estimated between $6,000-8,000). From another early collector is a southeastern Massachusetts painted pine and maple desk on frame (Lot 30, $3,000-5,000) with early surface and original Queen Anne brasses. Pennsylvania painted furniture is well represented by a spectacular 1825 Centre County, Pennsylvania, blanket chest (Lot 62, $8,000-12,000) with salmon paint embellished with yellow flowering vines, tulips, and geometric designs, and a Berks County, Pennsylvania chest made for Maria Elisabet Werbern (Lot 63, $10,000-15,000) decorated with mermaids, birds, and wildlife, previously exhibited at the Philadelphia Maritime Museum in 1986. Windsor seating furniture is well represented from the Gross and Diamond Collections, and features several examples that are pictured in Charles Santore’s book The Windsor Style in America. A diverse and fine collection of American furniture from eastern half of the United States amongst which is a set of twelve carved mahogany Grecian side chairs (Lot 363, $15,000-25,000) made in Boston c. 1815-25 that descended in the Fales family of Boston. These chairs exhibit superb design and craftsmanship that epitomized the classical period in Boston. 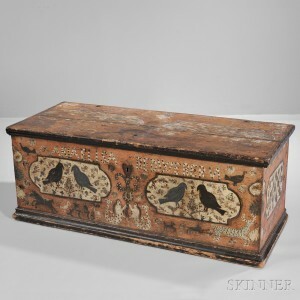 Formal furniture from the urban centers in Massachusetts, New Hampshire, Connecticut, Rhode Island, New York, and Pennsylvania presents an opportunity for astute collectors to capitalize on the present market. The American marine and landscape painter Thomas Chambers is represented by five examples of his vibrant and appealing images of America including a painting of Undercliff Near Coldspring (Lot 56, $20,000-30,000) which was exhibited in the Philadelphia Museum of art 2008-2010 and illustrated on page 108 of Kathleen A. Foster’s seminal work on Thomas Chambers. American folk art portraiture from the Estate of Jean Curtin, Georgetown, Maine, includes a full-length portrait of Mary A. Crockett, of Lincoln, Maine, by George Hartwell (Lot 89, $15,000-25,000). Other folk artists featured in the auction include William Mathew Prior, Sturtevant Hamblen, Micah Williams, and Joseph Davis. The auction includes a large assemblage of historical blue Staffordshire from a Midwest and a west coast collection. Composed of a variety of different forms from cups and saucers to large serving platters, scenes include Lafayette at Washington’s tomb, Lake George, Niagara Falls, MacDonnough’s Victory, Union Line, a four-portrait medallion plate, Battle of Bunker Hill, and West Point, among many others. A rare survivor from the first half of the 18th century is a pair of New England red woolen woman’s shoes (Lot 36, $800-1,200) in remarkable condition. Auction previews are free and open to the public and held in Boston Thursday, November 17 from 12-5PM and Friday, November 18, from 12-8PM. The print catalog is available for purchase from the Subscriptions Department at subscriptions@skinnerinc.com. Prices realized will be available at www.skinnerinc.com during and after the sale. 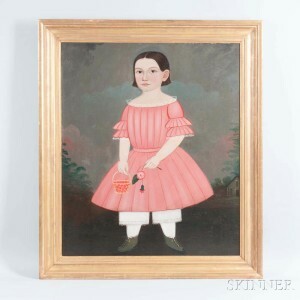 The Skinner website enables users to view all lots in the auction, leave bids, and bid live, in real-time through SkinnerLive! This entry was posted in News and tagged american clocks, american decorative arts, american folk art, American furniture, Americana, americana auction, Berks County Pennsylvania, blue Staffordshire ceramics, boston, George Hartwell, hand-painted signs, Janie and Peter Gross, Joseph Davis, Mary Baker Eddy, Micah Williams, painted furniture, Phineas P. Quimby, Pilgrim century furniture, skinner, skinner auctions, Sturtevant Hamblen, Thomas Chambers, trade signs, William Mathew Prior, windsor chair by Skinner. Bookmark the permalink.